 Get all the skills you need to rally race! The 4th edition of Bosnia Rally will start in 2019 in Kupres, (BIH). This plateau is famous for winter sports in Bosnia. The small town is located at about 1300m sea level and is perfect for our roadbook training camp. This exceptional plateau is criss-crossed by magnificent gravel roads and surrounded by a big forest. From buffalo herds, flocks of sheeps and wild horses, everything is expected here. Temperatures are very pleasant and are around 24C in July. The terrain is very diverse, ranging from dry sandy roads to wet forest ways. You will mainly drive 80% gravel roads and unpaved roads. Numerous tracks in all directions are available in Bosnia. About 300km a day on the finest rally tracks are prepared for the training. The route will be completely redesigned and will certainly be just as spectacular as the years before. You start together in a guided convoy up to the stages and meet up again at various service points, checkpoints and lunch stops. The organization always remains within reach and always controls the entire rider´s field. This training camp is particularly suitable especially for beginners. The navigation tower with all the devices and control components is expensive. We offer you the rental service for all the navigation instruments (Roadbook tower and trip master). The installation will take place on the day of arrival. 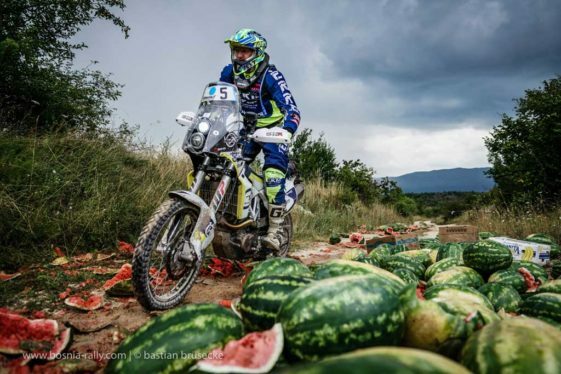 We would also provide you the rental service of a rally motorcycle, if you need it. The safety of participants is very important. For the first time the Moto medic crew with up to 3 rider´s are prepared. The mobile first responders are side by side with riders in the outback. The networked rescue teams are always within reach and are perfectly prepared for any type of situation. They know the local conditions and can provide medical care during an emergency. For the paddock of the training camp, a nice hotel has been chosen just outside Kupres. A large parking area next to the hotel serves as the basis of this event. Daily briefings and start konvoi are also going out from there. The hotel is located on a ski slope surrounded by beautiful nature. Supermarket, bars, cafes, and restaurants are located 4km from the hotel. The Hotel Adria Ski is well equipped with 80 rooms, restaurant, sauna and sports facilities. All participants will be accommodated in standard double rooms which includes breakfast.